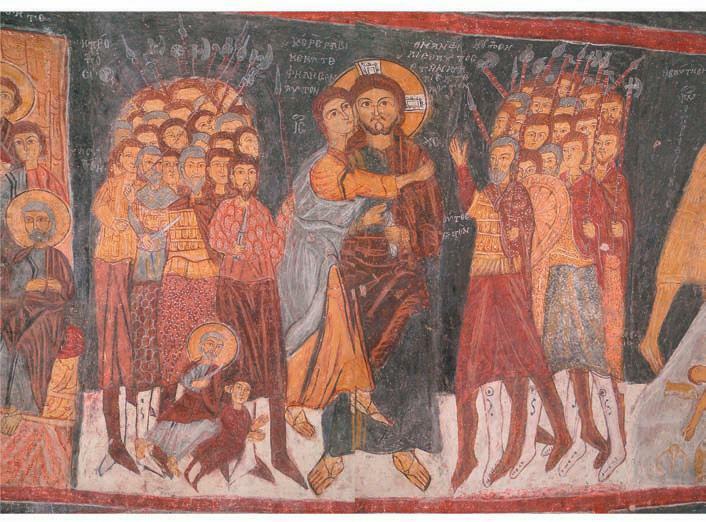 The temple of Saint John Chrisostomos in Arabissos (today Karsi Kilise, Suves), Kappadokia, was frescoed probably in 1212 AD by Theodore I Laskaris of Nikea to celebrate his victory over the Seljuks in the battle of Antiochia on Pisidia and contains valuable images of the warriors of the Nicaea Empire.55 One of its magnificent frescoes represents the Betrayal. 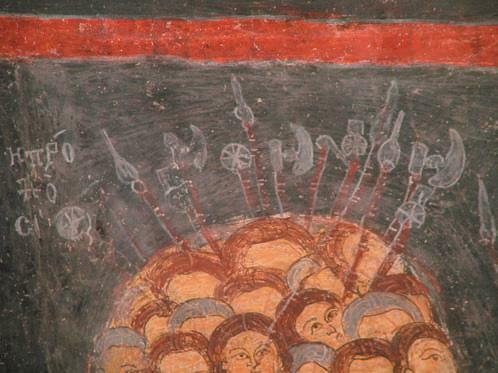 The heads of several spiked maces, war axes and spears are again visible above the heads of the warriors arresting Jesus (Fig. 28). 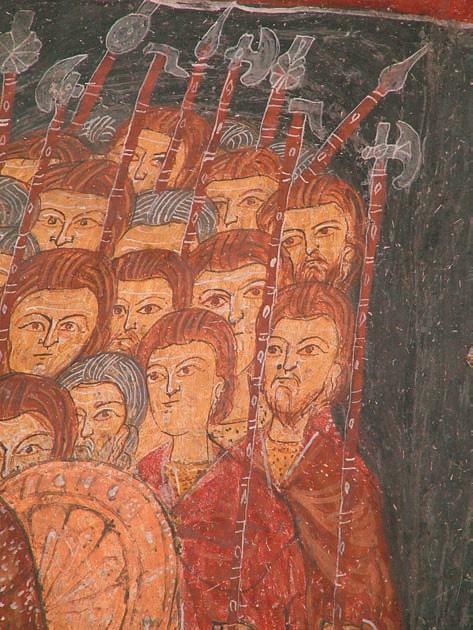 These warriors were probably copied from the militia of Theodore Laskaris I of Nikea, and I have recently proposed the identification of them with members of the Varangian Regiment serving under the Nicean Emperors, due to their red beards and their red uniforms, together with the long shafted axes represented as well in the fresco. Round and polygonal "star" maces are here represented alongside each other. Axes and poleweapons (Figs. 29-30) are well representative of 13th c. specimens and found their parallels with the Balkan weapons preserved in the Museum of Kazanlik, Bulgaria (Figs. 31-32). The main kind of defensive protections listed in the sources are well illustrated on the warriors: ring mail cuirass (λωρικιον, χιτων alusidotos);56 lamellar armours (klibania, χιτωνεs φολιδωτοι);57 and military clothes comprise cloaks (sagia),58 long robes (kabadia), tunics (χιτωνα),59 overtunics (επιλωρικια),60 military footwear, trousers and boots (toubia, anaxyrida, kampagia)61 (Fig. 33). 55 D'Amato 2010, p. 12. 56 Kolias 1988, p. 39; Tzetzes, in Cramer 1963 ( Anecd. Oxon III, 383). 57 Nicetae, 62, 95; 197,17ff. ; Kolias 1988, pp. 44-46 and n. 70. 58 Du Cange, Du Fresne 1688, col. 1752. 59 Du Cange, Du Fresne 1688, col. 1316. 61 Du Cange, Du Fresne 1688, col. 565 (καμπαγιον), 1588 (τουβιον) ; Niketas Choniates, VII,242 (anaxyrida). D'Amato R. 2010 The Varangian Guard 988-1453, Oxford. Kolias T. 1988 Byzantinische Waffen, Wien. Nicetae 1975 Nicetae Choniatae Historiae, ed. I. A. Van Dieten, Berlin-New York. Cramer J. A. 1963 Anecdota Graeca e codd. manuscriptis bibliothecarum Oxoniensium I-IV, Amsterdam. Du Cange, Du Fresne 1688 Glossarium ad scriptores mediae et infimae graecitatis, duos in tomos digestum, Lugdunum. Pseudo-Kodinos 1966 Traité des Offices, ed. J. Verpeaux, Paris. See also Varangian Guard(?) 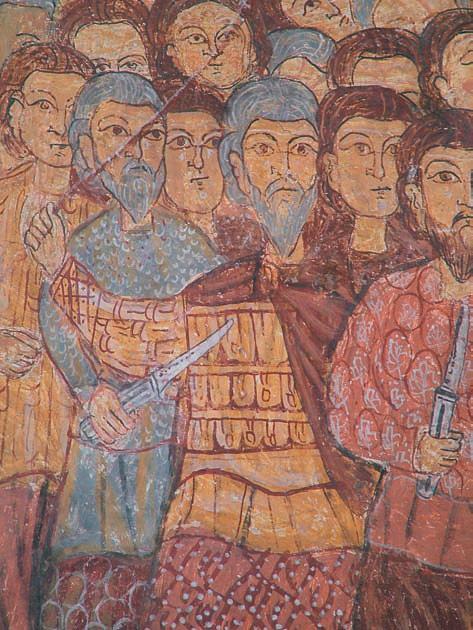 in The Betrayal, Mural in Aghios Georgios, Missolourgaki, Crete, 1401AD.